Traffic on the main street of Salmünster is reduced to a few cars of the local people as a result of the freeway and the modernized road that is avoiding the historic center. A large number of the buildings along the main street are either half-timbered houses or have their walls covered with wooden shingles in a local fashion. One of these old buildings is a historic inn: The Engel (”Angel”). It certainly has seen better days and one of those is remembered in the small, open stairway that leads to the main door of the building. A rustic, wooden bench on the right side of the wooden steps has some bottle caps lying on it. The brown paint is coming of a chipboard. You wouldn’t think much of it but then there is a plaque with a name on it: Napoleon I. 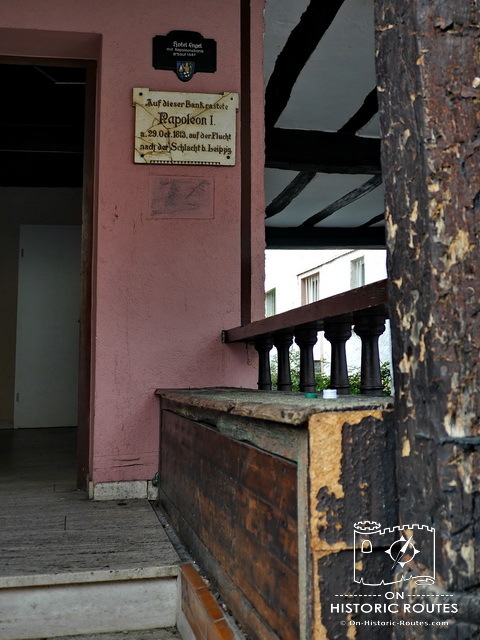 It claims that Napoleon sat on this very bench when he passed through Salmünster on 29. Oct. 1813 on his retreat from the Battle of Leipzig. Back in the 19th century, the main street of Salmünster was part of the Via Regia route through the Kinzig valley. It was a major piece of infrastructure in the area. The French army used the road to march eastward in the spring of 1813 from their staging area in France and on the Rhine. The Frankfurt-Leipzig road was the natural approach for their campaign grounds on the plains of eastern Germany to fight the Prussian and Russian armies. The campaign culminated in the Battle of Leipzig on 16.-19. Oct. 1813. Known also as the Battle of Nations it was a major defeat for Napoleon and the French forces. They had to withdraw and this retreat brought them back to Salmünster, where Napoleon – supposedly – rested on the rustic wooden bench. It is somewhat likely though that it happened. A large French force passed through the town during these days. A defeated army on its way to their winter quarters on the Rhine. Napoleon himself spent the night at Gelnhausen that day some 20 kilometers away and 20,000 of his soldiers fought in the Battle of Hanau the next day to open the way for the retreat of the whole army to Mainz. Napoleon’s forces never recovered from the defeat at Leipzig and the campaign in the spring of 1814 brought the fighting to France and Napoleon into exile on Elba. In a way, the plague in the hallway changes one’s perspective on this somewhat run-down building and of Napoleon himself. Napoleon was certainly one the most influential figures in history. Here, his larger-than-life existence becomes a bit more human. Defeated and on the run from his enemies, he sits down on a basic bench to rest. The Engel itself also looks a bit more like a historic inn now rather than just an old and abandoned place. These changes of perspective do not change reality. They are only in our mind but that is where history happens.